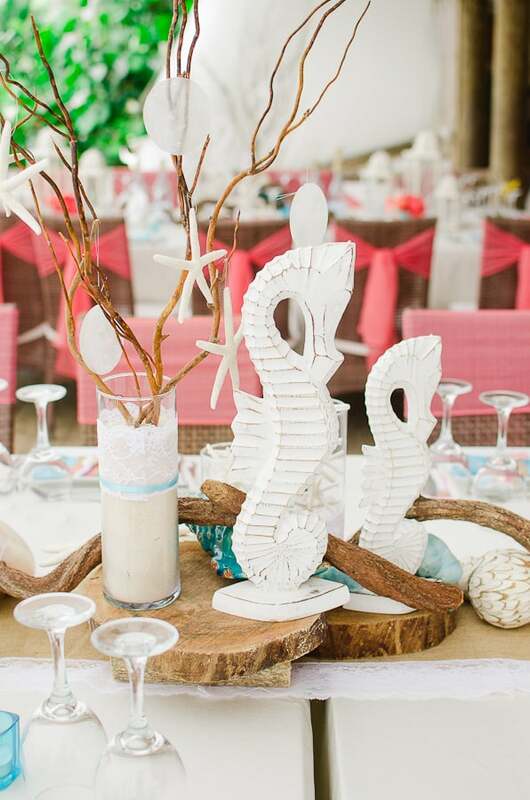 Ideas and pictures of beach theme wedding centerpieces, that’s what this page is all about! Although many brides simply use fresh exotic and tropical flowers for their beach wedding centerpieces, the truth is that when you think of beach theme wedding centerpieces, the elements that come to mind include sand, palm trees, the ocean and sea shells. You can incorporate all of those things into your arrangements without having them look cheesy or tacky. Whether you’re lucky enough to actually be getting married on the beach, or you simply want to incorporate that theme into your big day, here are some ideas to help inspire you. 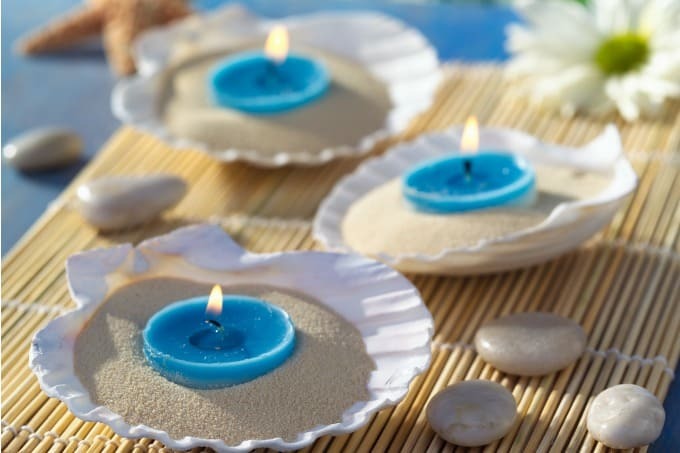 Here are some unique beach theme wedding centerpieces that incorporate the best of all worlds – shells, sand, flowers and candles. First up is a centerpiece that I absolutely love because it manages to be ultra beachy without being tacky or over the top. Credit: Wendy Alana Photography, See more from this real wedding here. This next one is pretty simple to pull off but can make a big statement. Get a large vase and fill it up with sand about one quarter of the way. 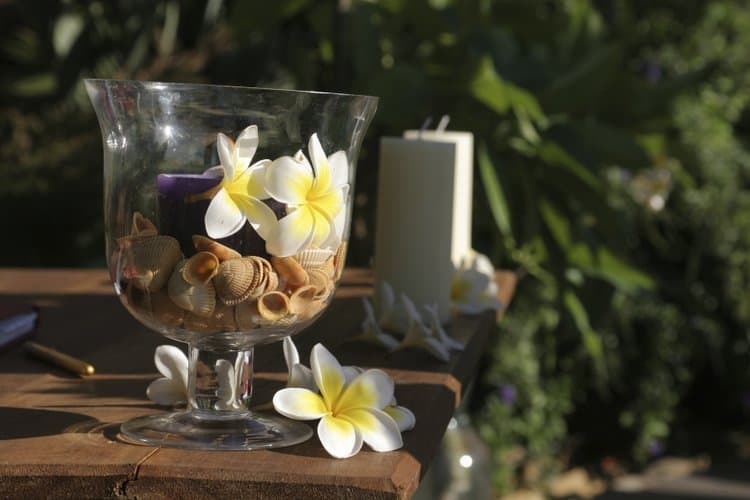 Then throw in some shells, put a large colorful candle in the center and two or three frangipani flowers (or any other flower of your choice). This is a great choice if you want candles but are afraid the wind might blow out the flame, because the vase will keep it from going out. 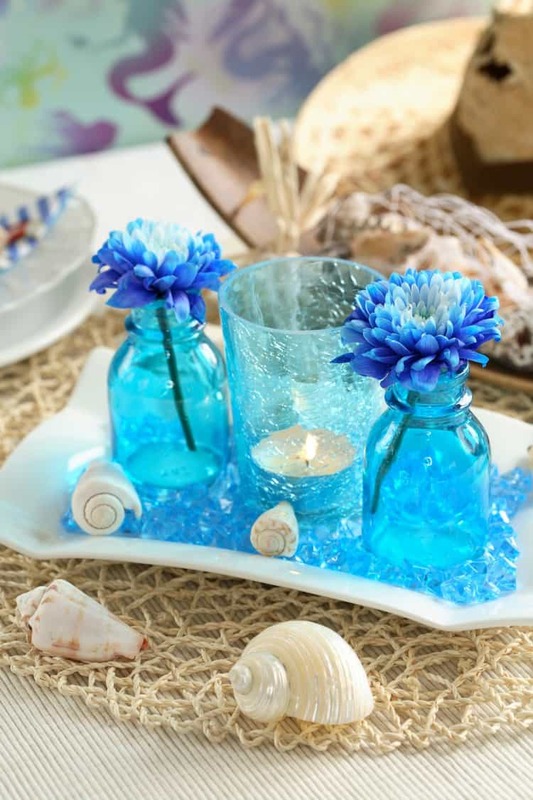 Blue is a popular color for oceanfront ceremonies, but because there aren’t many blue flowers to choose from, I get a lot of questions about how to creatively weave it into beach theme wedding centerpieces. Below is an idea that will really pop and look stunning. Want to replicate this look? Just purchase some blue crackled glass vases (you can find a lot of cheap ones on ebay), put one stem of your favorite blue flower (for example hydrangeas) and add a few seashells around it. 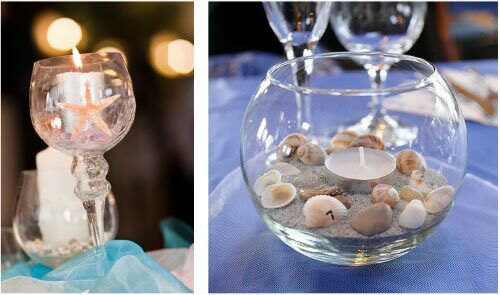 Below are two other very simple but beautiful beach theme wedding centerpieces. These are also very inexpensive to pull off. The picture on the left is one of my favorites and it’s probably the easiest one to create. All you need is a crackled candle-holder (you can purchase a set of 3 for $20 at Bed Bath & Beyond) and some candles. Next, get some starfish and place one inside the candleholder. This is a simple, beautiful and romantic way to weave in the ocean theme into your centerpieces. 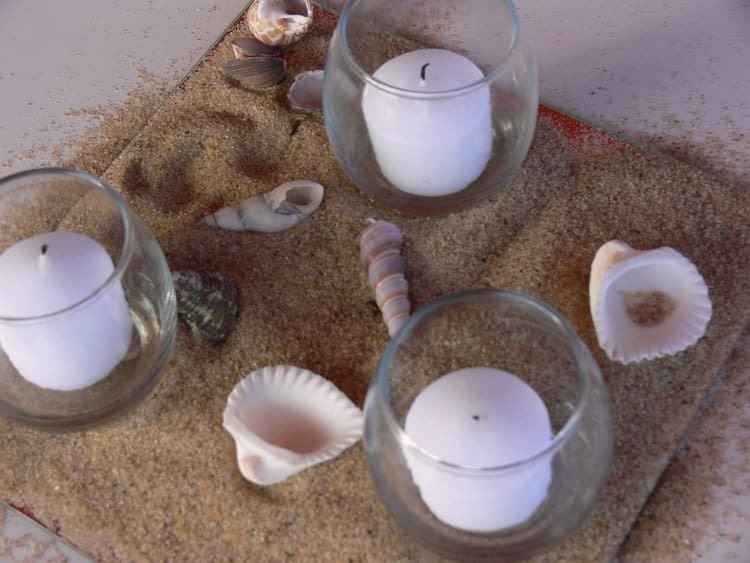 The idea on the right can be replicated by using a round fishbowl, some sand, a few shells and a tea light candle. If you want to add a hint of color to an otherwise natural and neutral backdrop, this next ideas is the perfect solution. 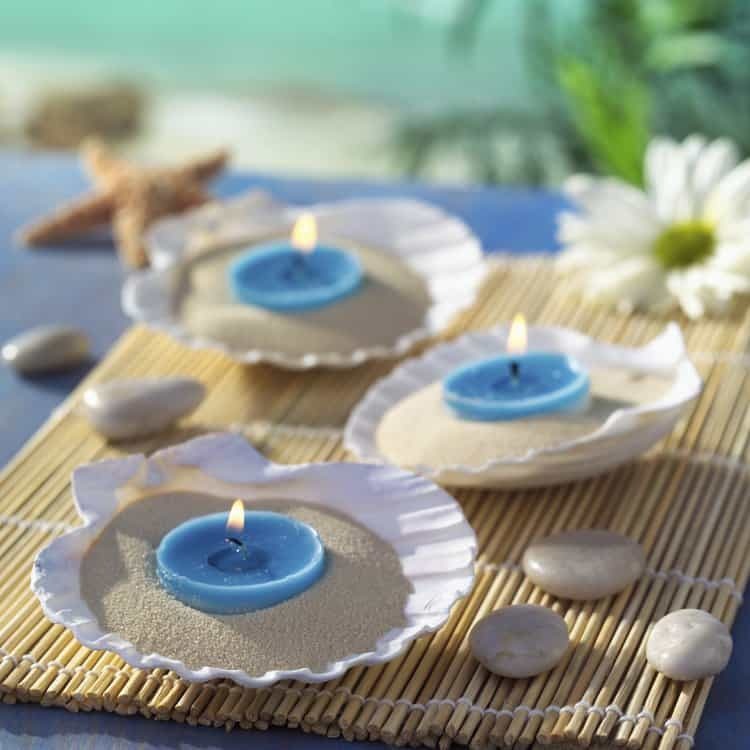 Just get some medium sized seashell dishes, fill them up with sand and anchor a colorful tea light candle within the sand. You can make this even more festive by placing two or three of them on top of a bamboo placemat and scattering a few rocks, starfish and flower petals around. One warning – this won’t work if your reception is in a very windy location. Not only will the sand blow everywhere, but the flames on the candles won’t hold up either. These are just a few ideas to get your creative juices flowing. It’s easy to create beach theme wedding centerpieces that are stunning and classy but still weave in the ocean elements in a subtle way. 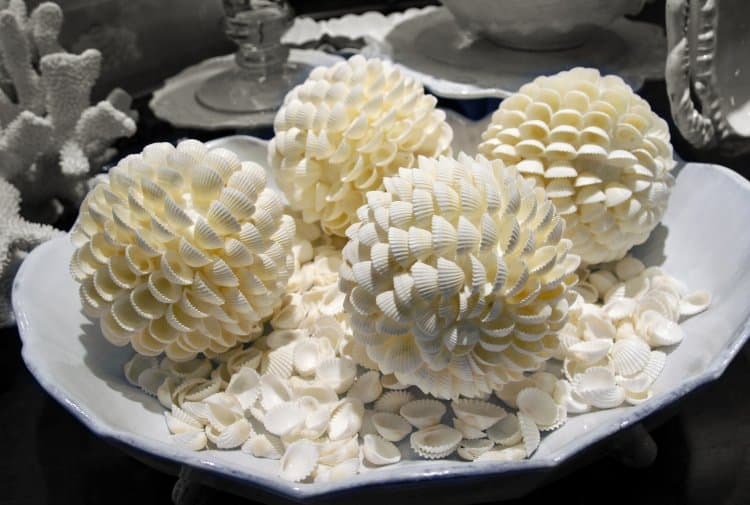 Another way to accomplish this is by taking a traditional centerpiece with your favorite flowers and adding a few seashells or sand dollars scattered around it on the table or glued to the front of the vase. Just get creative and think outside of the box! I love seeing different kinds of centerpieces at weddings. For my own wedding this year, I want to make sure everything matches my theme. I might try to put sand and a candle together like your example. Thanks!